André-Marie Ampère (/ˈæmpɪər/; French: [ɑ̃pɛʁ]; 20 January 1775 – 10 June 1836) was a French physicist and mathematician who was one of the founders of the science of classical electromagnetism, which he referred to as "electrodynamics". He is also the inventor of numerous applications, such as the solenoid (a term coined by him) and the electrical telegraph. An autodidact, Ampère was a member of the French Academy of Sciences and professor at the École polytechnique and the Collège de France. André-Marie Ampère was born on 20 January 1775 to Jean-Jacques Ampère, a prosperous businessman, and Jeanne Antoinette Desutières-Sarcey Ampère, during the height of the French Enlightenment. He spent his childhood and adolescence at the family property at Poleymieux-au-Mont-d'Or near Lyon. Jean-Jacques Ampère, a successful merchant, was an admirer of the philosophy of Jean-Jacques Rousseau, whose theories of education (as outlined in his treatise Émile) were the basis of Ampère's education. Rousseau believed that young boys should avoid formal schooling and pursue instead an "education direct from nature." Ampère's father actualized this ideal by allowing his son to educate himself within the walls of his well-stocked library. French Enlightenment masterpieces such as Georges-Louis Leclerc, comte de Buffon's Histoire naturelle, générale et particulière (begun in 1749) and Denis Diderot and Jean le Rond d'Alembert's Encyclopédie (volumes added between 1751 and 1772) thus became Ampère's schoolmasters. The young Ampère, however, soon resumed his Latin lessons, which enabled him to master the works of Leonhard Euler and Daniel Bernoulli. In addition, Ampère used his access to the latest books to begin teaching himself advanced mathematics at age 12. In later life Ampère claimed that he knew as much about mathematics and science when he was eighteen as ever he knew; but, a polymath, his reading embraced history, travels, poetry, philosophy, and the natural sciences. His mother was a devout woman, so Ampère was also initiated into the Catholic faith along with Enlightenment science. The French Revolution (1789–99) that began during his youth was also influential: Ampère's father was called into public service by the new revolutionary government, becoming a justice of the peace in a small town near Lyon. When the Jacobin faction seized control of the Revolutionary government in 1792, his father Jean-Jacques Ampère resisted the new political tides, and he was guillotined on 24 November 1793, as part of the Jacobin purges of the period. In 1796 Ampère met Julie Carron, and in 1799 they were married. André-Marie Ampère took his first regular job in 1799 as a mathematics teacher, which gave him the financial security to marry Carron and father his first child, Jean-Jacques (named after his father), the next year. (Jean-Jacques Ampère eventually achieved his own fame as a scholar of languages). Ampère's maturation corresponded with the transition to the Napoleonic regime in France, and the young father and teacher found new opportunities for success within the technocratic structures favoured by the new French First Consul. In 1802 Ampère was appointed a professor of physics and chemistry at the École Centrale in Bourg-en-Bresse, leaving his ailing wife and infant son Jean-Jacques Antoine Ampère in Lyon. He used his time in Bourg to research mathematics, producing Considérations sur la théorie mathématique de jeu (1802; "Considerations on the Mathematical Theory of Games"), a treatise on mathematical probability that he sent to the Paris Academy of Sciences in 1803. After the death of his wife in July 1803, Ampère moved to Paris, where he began a tutoring post at the new École Polytechnique in 1804. Despite his lack of formal qualifications, Ampère was appointed a professor of mathematics at the school in 1809. As well as holding positions at this school until 1828, in 1819 and 1820 Ampère offered courses in philosophy and astronomy, respectively, at the University of Paris, and in 1824 he was elected to the prestigious chair in experimental physics at the Collège de France. In 1814 Ampère was invited to join the class of mathematicians in the new Institut Impérial, the umbrella under which the reformed state Academy of Sciences would sit. Ampère engaged in a diverse array of scientific inquiries during the years leading up to his election to the academy—writing papers and engaging in topics from mathematics and philosophy to chemistry and astronomy, which was customary among the leading scientific intellectuals of the day. Ampère claimed that "at eighteen years he found three culminating points in his life, his First Communion, the reading of Antoine Leonard Thomas's "Eulogy of Descartes", and the Taking of the Bastille. On the day of his wife's death he wrote two verses from the Psalms, and the prayer, 'O Lord, God of Mercy, unite me in Heaven with those whom you have permitted me to love on earth.' In times of duress he would take refuge in the reading of the Bible and the Fathers of the Church." For a time he took into his family the young student Frédéric Ozanam (1813–1853), one of the founders of the Conference of Charity, later known as the Society of Saint Vincent de Paul. Through Ampère, Ozanam had contact with leaders of the neo-Catholic movement, such as François-René de Chateaubriand, Jean-Baptiste Henri Lacordaire, and Charles Forbes René de Montalembert. Ozanam was beatified by Pope John Paul II in 1998. In September 1820, Ampère's friend and eventual eulogist François Arago showed the members of the French Academy of Sciences the surprising discovery of Danish physicist Hans Christian Ørsted that a magnetic needle is deflected by an adjacent electric current. Ampère began developing a mathematical and physical theory to understand the relationship between electricity and magnetism. Furthering Ørsted's experimental work, Ampère showed that two parallel wires carrying electric currents attract or repel each other, depending on whether the currents flow in the same or opposite directions, respectively - this laid the foundation of electrodynamics. He also applied mathematics in generalizing physical laws from these experimental results. The most important of these was the principle that came to be called Ampère's law, which states that the mutual action of two lengths of current-carrying wire is proportional to their lengths and to the intensities of their currents. Ampère also applied this same principle to magnetism, showing the harmony between his law and French physicist Charles Augustin de Coulomb's law of magnetic action. Ampère's devotion to, and skill with, experimental techniques anchored his science within the emerging fields of experimental physics. Ampère also provided a physical understanding of the electromagnetic relationship, theorizing the existence of an "electrodynamic molecule" (the forerunner of the idea of the electron) that served as the component element of both electricity and magnetism. Using this physical explanation of electromagnetic motion, Ampère developed a physical account of electromagnetic phenomena that was both empirically demonstrable and mathematically predictive. 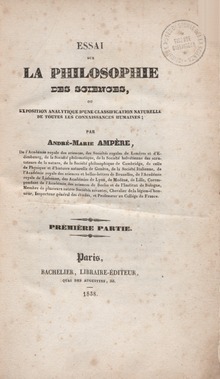 In 1827 Ampère published his magnum opus, Mémoire sur la théorie mathématique des phénomènes électrodynamiques uniquement déduite de l’experience (Memoir on the Mathematical Theory of Electrodynamic Phenomena, Uniquely Deduced from Experience), the work that coined the name of his new science, electrodynamics, and became known ever after as its founding treatise. In 1827 Ampère was elected a Foreign Member of the Royal Society and in 1828, a foreign member of the Royal Swedish Academy of Science. 8.10.1825: Member of the Royal Academy of Science, Letters and Fine Arts of Belgium. In recognition of his contribution to the creation of modern electrical science, an international convention, signed at the 1881 International Exposition of Electricity, established the ampere as a standard unit of electrical measurement, along with the coulomb, volt, ohm, and watt, which are named, respectively, after Ampère's contemporaries Charles-Augustin de Coulomb of France, Alessandro Volta of Italy, Georg Ohm of Germany, and James Watt of Scotland. Ampère's name is one of the 72 names inscribed on the Eiffel Tower. Several items are named after Ampère; many streets and squares, schools, a Lyon metro station, and an electric ferry in Norway. Lisa M. Dolling; Arthur F. Gianelli; Glenn N. Statile, eds. (2003). The Tests of Time: Readings in the Development of Physical Theory. Princeton: Princeton University Press. pp. 157–162. ISBN 978-0691090856. .
^ "Ampère". Random House Webster's Unabridged Dictionary. ^ Dictionary of Scientific Biography. United States of America: Charles Scribner's Sons. 1970. ^ "Andre-Marie Ampere". IEEE Global History Network. IEEE. Retrieved 21 July 2011. One or more of the preceding sentences incorporates text from a publication now in the public domain: Chisholm, Hugh, ed. (1911). "Ampère, André Marie" . Encyclopædia Britannica. 1 (11th ed.). Cambridge University Press. pp. 878–879. ^ "Catholic Encyclopedia". Retrieved 29 December 2007. ^ "Library and Archive Catalogue". Royal Society. Retrieved 13 March 2012. ^ "Batterifergen har måttet stå over avganger. Nå er løsningen klar". Teknisk Ukeblad. Retrieved 19 November 2016. Williams, L. Pearce (1970). "Ampère, André-Marie". Dictionary of Scientific Biography. 1. New York: Charles Scribner's Sons. pp. 139–147. ISBN 978-0-684-10114-9. Hofmann, James R. (1995). André-Marie Ampère. Oxford: Blackwell. ISBN 978-0631178491. Wikimedia Commons has media related to André-Marie Ampère. O'Connor, John J.; Robertson, Edmund F., "André-Marie Ampère", MacTutor History of Mathematics archive, University of St Andrews . Weisstein, Eric Wolfgang (ed.). "Ampère, André (1775-1836)". ScienceWorld.